Loving Instagram? How about a sharing more than just photos? Videos you're saying? Why yes. Vine to the rescue. 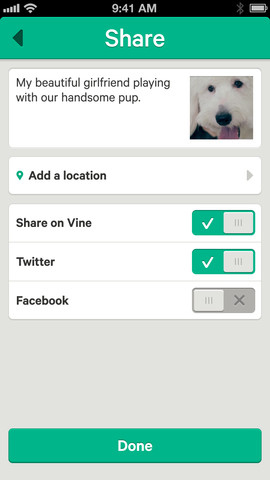 With Vine, you can easily share short snippets of your life in motion. 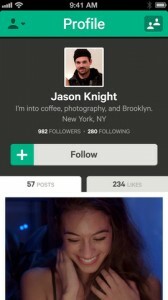 The app is free to donwload, you have unlimited free downloads, and pretty much all the functionality you would expect from a trendy social networking app, including following people, sharing, interacting with other people through comments and likes, hashtags or editor's picks (which is another way of saying featured vines). Vine has one of those interfaces that tend to get out of your way. Less is more and this is especially true with Vine. To start shooting a new video, press the video button and start filming by touching the screen anywhere. As long as you keep the finger pressed to the screen, the video will continuously shoot. Lift your finger and the video stops. As soon as you start shooting, the top meter measures how much of your available six seconds you still have at your disposal. 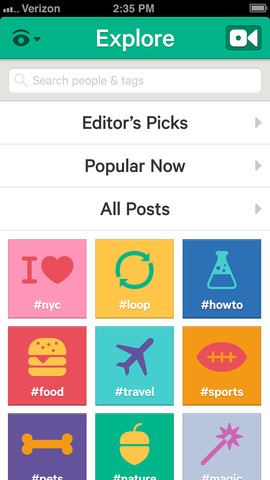 The lenght of the videos (a mere 6 seconds) feels perfect for Instagram fans. Viewing a 6 second video is almost as fast as viewing an Instagram shot, but you get so much more information from a moving picture than you would from still photography. Upon opening Vine, you can choose to login via email (your vine account), or sign up with Twitter, which I suspect most users will do anyway. After that, you're greeted with the home screen that displays editor picks, videos from your friends and people you follow on Vine. You can either browse popular picks or search by hashtag via the button on the top left. The feed of videos is quite intelligent as well. The video in the center of you screen will automatically start playing, and videos that out of view will automatically be stopped as soon as a new video begins to play. Scrolling becomes a natural gesture. There are no play and stop buttons, so with the flick of a finger you can quickly browse your home feed. Shooting a new video is a breeze and something I quite enjoyed doing. What you won't be able to do is actually edit the video. It's all or nothing. You either nail the video from start to finish, or any screw up will set you back to second 0. Unfortunately, it's not just about a brilliant user experience, great graphics and intelligent scrolling. Like with any social networking app, the content can make it or break it. And even though Vine is just in the early stages, although it's been on the Top Free in the App Store for the past month, I found that your experience may vary with Vine when it comes to content. I would categorize the people sharing stuff on Vine into two broad categories. People that share 6 second clips that make you go #wow or #omg, clips that teach you #howto do things, and clips from everyday #life. The stop motion clips are pretty great as well. Then there's the people that try their best to fill the 6 seconds of fame with useless crap that just makes you hate the whole experience. There are those idiots that film themselves screaming, making faces or trying to be funny through some rather idiotic skits. Yes, we're all Jerry Seinfeld apparently. Some people are just sad. In fact, this is my one disappointment with Vine. The lack of better content or the ability to somehow filter out videos based on tags or how many times it's been flagged. Obviously, you can't report a video for being simply dumb, but seriously, there needs to be some sort of filters. Please, let's not turn Vine into a social network with cat videos or what we've eaten during the day. 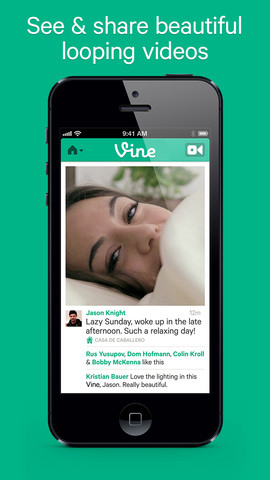 What do you think of Vine? Scroll down for our comment section and let us know! Chop, Chop Goes The Guillotine!